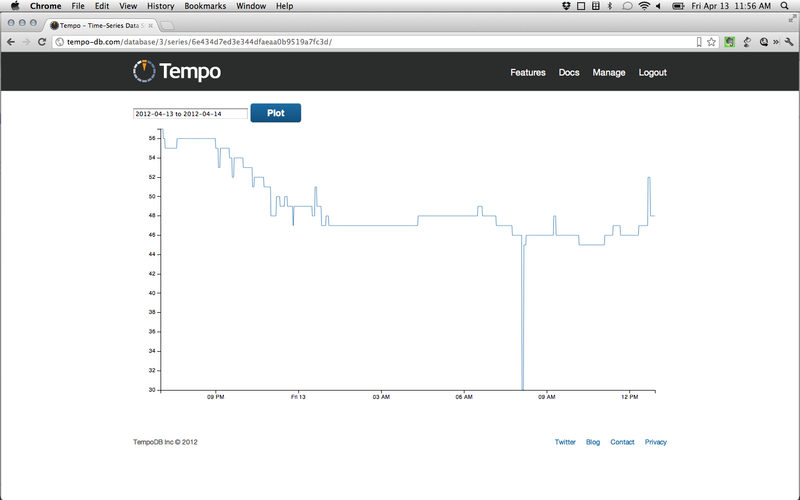 TempoDB, a startup out of Chicago, has built a database-as-a-service offering specifically for time-series data. CEO and co-founder Andrew Cronk presented at the TechStars Cloud demo day earlier this week, and laid out the need for a specialty database for data that comes from thermostats, sensor networks, networking gear and other machines that spit out both values and times. But does the world (or the Internet of Things) need a specialty time-series database? Customers using TempoDB surely say yes. One company, a startup making a connected thermostat, throws off 20 pieces of data per second. The company, InThrMa, used to only be able to store its data for 30 days in its MySQL database before tossing it. Putting it into Hadoop wasn’t really an option because the records need to be stored and read in the same order they come in (although the TempoDB service is built on open source tools including Hadoop and Hbase.) In addition to the storage, though, TempoDB adds analytics. “We’re basically an API call to your data,” says Cronk. Cronk and his two other co-founders build TempoDB to serve the needs of the nascent sensor market, the oil-and-gas industry and any other industry that might care about measuring data confined by when the data was collected. Cronk said the solar panel market likes the technology because they can track efficiency and performance of individual cells and write algorithms that can help optimize energy generation. Outside of smart grid and energy, e-commerce might use this or even the insurance industry as it attempts to track drivers’ habits in real-time. But an issue for TempoDB, which like Google’s Big Query or 1010data, offers its database as a service, may be the type of data involved and a customers’ willingness to send it to a cloud, even one hosted by TempoDB. For example, sensor data in oil and gas that can help detect new oil reserves would be highly sensitive and not something easily trusted to a startup or a cloud. Auto insurers might have the same qualms. Cronk said so far he’s steering customers with those concerns to the idea of storing it in a private cloud, since building a software solution is very different business than the services business he’s built the company for. Another issue is the potential for an open source competitors to emerge. Cronk says he has no plans to open source the software and says that the closest open source competition is a project called OpenTSDB that arose out of StumbleUpon for measuring server log data every minute. Update: OpenTSDB can store up to 1 billion data points a day, measuring log data every few seconds if needed. He says it’s not nearly as robust as TempoDB’s product. There are also potential competitors such as SpaceCurve or Space-Time Insight, databases for measuring location and time, but their solutions are built for more complicated data.